From the Port of Puntarenas, to just south of Manuel Antonio National Park, the Central Pacific area of Costa Rica is full of incredible places to explore and enjoy. Just one hour drive from San Jose you can take a boat ride on the Rio Tarcoles and see huge crocodiles, take an island cruise around the Gulf of Nicoya, visit Carara National Park, a transitional rain forest, the second most diverse ecosystem, only after Tropical Rain Forest, catch some waves at some of Central America’s best surfing beaches, deep sea fish, or pump up some adrenaline zip lining, rappelling, and canyoneering. In the last few years the Central Pacific of Costa Rica has gone through a big boom in development. Luxury hotels, marinas, shopping centers, golf courses, fine restaurants, have become the center for tourism in the area. Visitors can still enjoy all kinds of outdoors activities too though. Nature and wildlife, fishing, diving, hiking, or simply relaxing at the beach. The Central Pacific has something for everyone. Puntarenas is the closest coastal town to San Jose. It serves as a major cruise line port as well as the most important port for import and export on the Pacific. While the town itself is a bit seedy, it is popular with locals for weekend trips to the beach or outings for fresh seafood dinners. The cities ferry terminal is the only place to catch the ferry (car and foot) to the Southern Nicoya Peninsula. Jaco was one of the first towns in the Central Pacific to be hit by the tourism explosion. From a sleepy surfers and backpackers town, to party central of the Pacific Coast. It’s a popular destination for bachelor party trips, fishing groups, and people looking to take part in the colorful night life. Jaco is a good shopping spot by day, but by night if scantily clad working girls will offend you, best to avoid this area. Surfing remains excellent and a top draw too. Quepos is the gateway town to Manuel Antonio and points south. It’s a sleepy fishing town, with touches of tourism but an authentic vibe. You’ll find good restaurants and shopping, and a big mix of locals and visitors. The new Pez Vela Marina is the starting point for charter fishing, catamaran sails, and the fresh seafood that is so popular in town and in Manuel Antonio. Most visitors prefer Manuel Antonio, with its lovely boutique hotels, but Quepos remains a good value too. Just 7 KMs from Quepos is the smallest National Park in Costa Rica, Manuel Antonio. The small town has grown around the park providing visitors with great dining, nice shopping, and many excellent hotel choices. The rainforest meets the beach here, and it’s a lovely blend. Monkeys cavort through the trees, sloths are visible from the road, and hotels are filled with tropical birds. Located within the Punta Leona complex, Playa Blanca is an incredible ¾ mile stretch of soft white sand. Visitors enjoy clear warm water, gentle waves, and a palm tree frame. 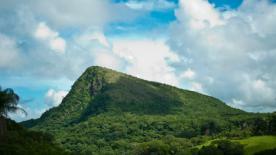 Because of its location within a private reserve, it’s easy for guests to see monkeys, sloths, and tropical birds too. It’s just 90 minutes driving from San Jose, making it very convenient for day-trippers. One of Costa Rica’s most popular tourist destinations, Jaco Beach is a huge draw for surfers. With 2.5 miles of fantastic surf, Jaco draws International surfers and is the home to several surfing competitions each year. The strong undertow, and brown sand, make it a not so popular choice for sun bathers, but if visitors want to combine a beach stay with boisterous night life, Jaco is a good choice. Just 6 miles south of Jaco is one of the most hard-core surfer beaches in the country, Playa Hermosa. This area is known for consistently large waves. This consistency draws surfers from all over the world. Playa Hermosa holds a large surfers convention and competition every year. This beach is not recommend for casual swimming due to the under tow and rough surf. Playa Esterillos is a relatively undiscovered beach located between Jaco and Quepos. The warm brown colored sand stretches on miles and miles. You can visit this stretch of beach and walk for miles without seeing another person. It’s quiet and natural, a real off the beaten track destination (while still being pretty close to the “track”). Visitors must be very careful about swimming anywhere near Esterillos. The under tow is savage, and swimmers are often taken by surprise. Best for beach combing and wading. 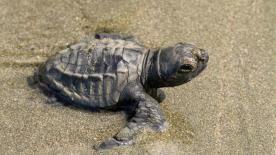 Visitors can enjoy the public beach in Manuel Antonio and safely swim and learn to surf. Vendors line the sidewalks selling food and drinks, surf boards and boogie boards are available for rental, and a nice mix of local people and visitors spend time here. If you are looking for a more natural setting, enter the National Park and enjoy 3 choices of beaches. 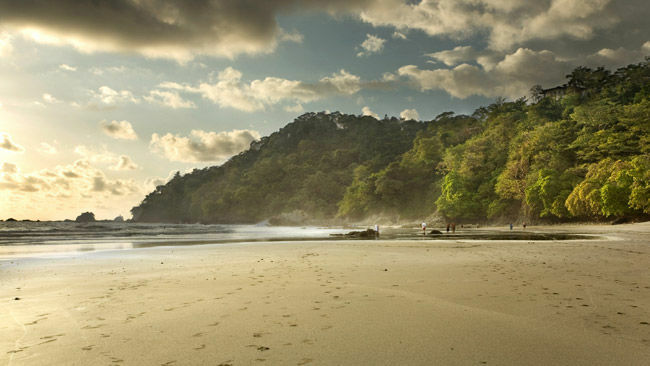 South of Manuel Antonio is one of Costa Rica’s most incredible hidden gems; Playas Matapalo and Linda. You can access these beaches from the main road heading south to Dominical. It’s best to have a 4X4 as some areas are rugged driving. Once you arrive you’ll find pristine light sand beaches, trimmed with palm trees and wild almonds. You can swim in the calm surf, and walk for miles without seeing any signs of development. It’s a great location for a private picnic day at the beach. Carara National Park is located 52 KM west of San Jose on the southern banks of the Rio Tarcoles. Despite the parks proximity to San Jose, it does not attract the large number of visitors one might expect. The park is a favorite with bird watchers, as it remains one of the best places to see the Scarlet Macaw. An important Macaw rehabilitation program began in the mid-1980s, with rangers patrolling against poaching. Rangers also built artificial nests to provide safe homes for the macaws. The population has grown substantially and the program continues today. Carara remains one of the most important wild life corridors in Central America. The park connects the Dry Tropical Forest of Guanacasate to the Tropical Rain Forest of the Southern Pacific. Carara is classified as a Transitional Tropical Forest. The forest is home to a huge variety of bird species, mammals large and small, and a wide array of reptiles. Make sure to take time to visit the marshlands, ponds, and admire the huge towering cashew trees. At just 682-hectares, Manuel Antonio is the smallest national park in Costa Rica. It is also the second most visited park, with more than 175,000 visitors annually. 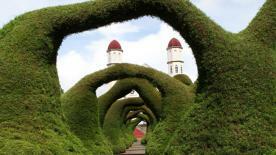 The park is a wonderful combination of lush green tropical rain forest and pristine beautiful beaches. There is a long network of trails for hiking and wild life viewing. Most recommended are Cathedral Trail and Perezoso (sloth) Trail. Visitors can expect to see 3 species of monkeys, sloths, anteaters, agoutis, deer, armadillos, tropical birds, and reptiles. If relaxing at the beach is more what you had in mind, enjoy one of four options inside the park. Espadilla Sur, Manuel Antonio, Escondido, and Playita. Manuel Antonio National Park is closed on Mondays. Make sure to take what you need with you, as there are no concessions inside. You must be careful with food, as raccoons and monkeys are clever thieves and will open back packs and satchels to get to your snacks.